Join the Cretan hospitality! Cretans says that we have the finest gastronomical, tasty and healthy solutions proved and signed by the medical science society. Wild green pies, spinach pies, Raw veggies salads, Veggies in the pot or in oven Cretan traditional way, cooked a way only Cretans do, and much more. Enjoy food and cooking class that blend all the secrets particular of Crete and let you enjoy & learn about them first-hand alongside the locals. Dinner at traditional restaurant in the heart of Arhanes with variety of Cretan Mediterranean vegetarian / vegan specialties or if arrival is early enough we can do a cooking class work together and prepare the dinner. Arrival the airport or port of Heraklion. Reception at the airport or port. Transportation to the lodge at village Arhanes, 11 km south city of Heraklion. Accommodation in Arhanes at class traditional apartment in fine location. Breakfast, put the luggage at the car and the day start by visiting the palace of Knossos. Is not comprehended somebody visits Crete and it does not see the Knossos. It is as food without salt. Ending the visit of Knossos we drive south to the near village of Dafnes where we meet a local lady. She is a living treasure. She prepares unique foods. We stay for lunch and taste her cooking. After lunch we drive for a visit to a bee keeper and a women co-operative workshop. The place is 20 km far from the city of Heraklion; Beautiful untouched nature is perfect pasture for bees. Old traditional bee-keeping methods ensure ecological, clean and free from any additives honey and other bee products. irst honey of the season is collected from spring thyme blossoms. This golden yellow honey is perfect source of natures ingredients. We do a break at the small local caf / restaurant run by the bee-keepers since 1949. The owners (two brothers) have been beekeepers since all their lifetime taking the business from their father. 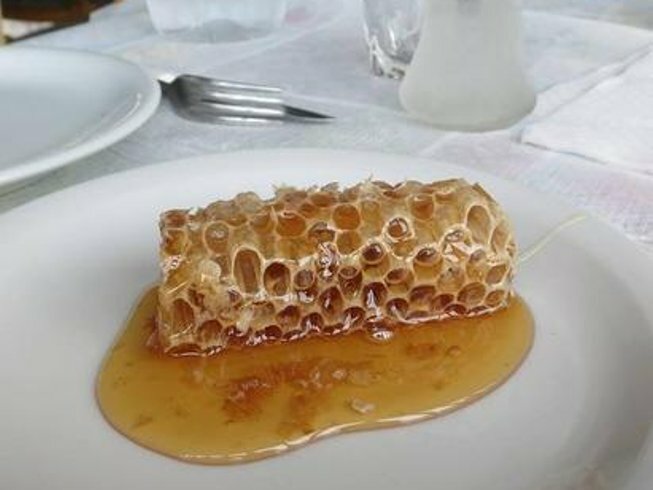 Therefore, we taste honeycombs straight from the beehive and learn everything about bees and beekeeping as well as having a kind of pancakes we call them tiganites, deep in honey and small cheese pies with honey in company with local wine and the Cretan snap, Raki. You will definitely feel the positive effect to your body and soul. A visit to a women cooperative at the near village of Marathos where they make the very special (unique art pastry small and bigger round breads), we call them Xompliasto Koulouri. And drive back the airport or port of Heraklion and our tour ends. Transfer from and to Airport. Custom dates available for a minimum of 2 people or price for 2 people. Entrance fees are extra. Vegetarian Food, Wine and Culture holidays are suitable for all. Non-vegetarians are welcome on the holiday but they must be aware no meat will be used during the food tours. Please specify what type of vegetarian diet you follow at the time of booking. Accommodation with similar quality may be substituted depending on availability and request. Room upgrades available on request. We provide travel services, please contact us. For more information ask your questions directly toPorto Club Travel Serviceswho will be happy to assist you. Simply click on the Contact Organizer button to send a message. Cretans eat an abundance of fruits and vegetables. The fat we use in our cooked food and salads is mainly olive oil. We eat pulses and vegetables in large amounts. They are the basis in our daily diet. No more than two or three days would go without pulses in a meal and not a day without vegetables, wild greens, olives, uncooked fresh vegetables and greens as salad, Cretan rusks and fruits. We eat more fruit than most, in fact, 4 times more than the other inhabitants of the Mediterranean. A traveler in Greece when goes for lunch or dinner can find a huge variety of vegetarian / vegan meals in Estiatorion (restaurant). In these restaurants they present their specialties in show tables so guests can view the meals and choose one of them. Estiatorion is restaurant that operates mostly for local people. They always supply a big number of free-meat dishes we call them Ladera. You can find them at taverns or other kind of restaurants but Estiatorion is the ones I always suggest. I have no compunction in saying that Crete and Greece is an ideal destination for a vegan / vegetarian, at least nutritionally. There is still a long way to go to connect with the philosophy and spirit of the vegan way, but any vegan visitor will be surprised at how harmoniously local Cretan people live with animals, almost all of whom free range in the fields or mountains. I hope and believe respect is a good first step between Cretans and vegans / vegetarians worldwide. For many Greeks (especially in the countryside and islands), five days a week their meal is vegetarian or vegan. Yes, Greeks are meat and dairy eaters, but because such a large percentage of our diet consists of pulses, vegetables, greens and fruits, a vegan or vegetarian visitor will not have any difficulty in finding a huge variety of vegetarian food all over Greece. You dont have to apologize or explain why you dont eat meat. Taste the healthy Cretan and Greek Mediterranean meat-free delicacies and our fine wine. You shall feel strong humanity, away from the stress of our daily life. You shall feel the warmth of Greek and Cretan company. You shall be captured by the place, perhaps because you think that time has stood still or because they welcome you with a shot of Tsikoudia with Cretan rusks and fresh tomato or a tsipouro or an ouzo. Cookies:On Crete, these cookies are traditionally made and served over the Christmas and New Year's holiday season. They are enjoyed at other times of year as well, but in December and January, they come together to create a fabulous collection of tastes and textures. Kourabiethes:Kourabiethes (also kourambiedes) are traditional celebration cookies, served at Christmas, New Year's, weddings, and baptisms. Toasted almond shortbread-type cookies topped with a generous coating of confectioner's sugar, they melt in the mouth. Melomakarouna:Melomakarona are a Christmas tradition in Greece (but enjoyed at other times of the year). All over Greece, kitchens will be filled with the wonderful smell of these spice cookies that will adorn tables, be given as hostess gifts, and eaten in huge quantities. Pies:Crete is famous for its cuisine and mostly of its traditional Kalitsounia, which are small pies that can be filled with different fillings, such as cheese (tyropitakia) or greens and wild herbs (Hortopitakia). These unique delicacies are served across the entire island and are a very tasteful and healthy snack you can enjoy any time of the day, as an appetizer or light meal. Spoon Sweets:Spoon sweets are healthy confections, visually pleasing, distinctive, and extremely versatile. Offering them to guests is a wonderful tradition and a sign of "sweet" hospitality. Nowadays they are used as healthy spreads, in baked goods, and to top ice cream, cakes, and yogurt. Spoon sweets reflect the spirit of the Cretan and Greek hospitality. Spoon sweets are a traditional offering in Greek homes. Spoon sweets are fruits, preserved in syrup. They are commonly known as "spoon sweets" which translates to sweet of the spoon. due to the traditional way of serving the sweets on a well-filled teaspoon accompanied by cold water. Kalitsounia:These sweet cheese pastries are an Easter favourite on the island of Crete. 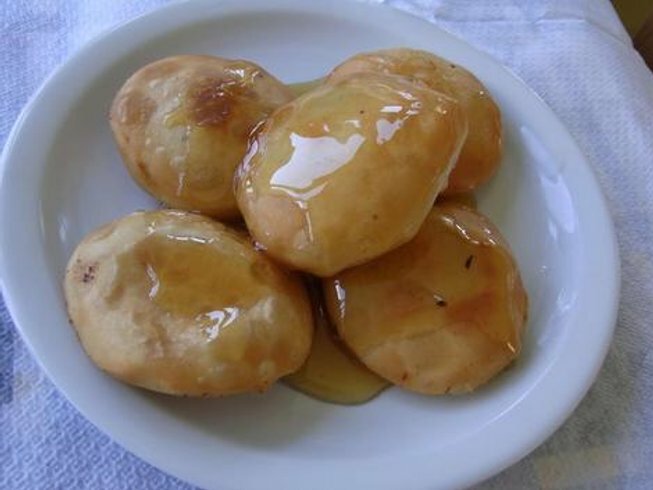 Kouloura:These sweet breads are an Easter favourite as well on the island of Crete. Pastries:these cookies are traditionally made and served over the Easter holiday season. "My name is George Portokalakis, and I salute the vegans and vegetarians worldwide. I was born and live on the island of Crete in Greece. I am involved in everything concerning tourism. I am specifically concerned with private and tailor made tourism, as well as cultural, religious, alternative, culinary and cooking tours. Over the past thirteen years I have studied and worked very hard to learn as much as possible of vegetarianism. I have learned a lot! I can not say I am fully vegan or vegetarian, but nutritionally I live half of my days as vegan, and three quarters of my life as vegetarian. I have been diabetic since 1999. I do not use any insulin or heavy drugs, and over the past 6 years, following the Easter period Orthodox vegan feast, which lasts 49 days, I have found that my blood sugar came much closer to normal levels. In the old days, being a city child, I couldnt imagine the charm of a diet that follows the passing of one season to the next. Later on, when I became involved in alternative tourism and having in me the love of cooking, I watched more carefully the various dishes of our local farming cuisine. I found that, above all, the most important thing is the tasty hand. It is true! No food, bread, vegetable, sweet, cookie or cake, produced by hand can be the same as another one. Every hand has a unique strength, warmth, power and skill. Behind the unbelievable inspiration and taste sensations of Cretan and Greek traditional cuisine there are many, many tasty hands. Based on that spirit, the Greek traditional cuisine is an art that has been in practice for thousands of years by talented, creative and unnamed women, and today we are the recipients of this art. I also discovered the huge number of meat-free dishes all over Greece, ideal for a vegan / vegetarian traveler." George has been working in the travel industry for over 40 years but has always had an love and interest in food and the food industry. George has had two experiences running his own restaurants and has catered for Cretan weddings as well as running cookery holidays on the island. He began offering cooking holidays in response to guests request whilst working in travel and has run the holidays for a number of years. Georges interest and expertise in vegetarian and vegan cuisine came in response to some guests comments that Cretan and Greek food is heavily meat focused. He took it upon himself to prove to his guests that Crete and Greece was the perfect destination for vegetarians and vegans, and over the years he has worked extensively with the International Vegetarian Society, and Vegan Society. George is well rehearsed in vegetarian and vegan diets and hopes to show visitors the richness of Cretan food that he believes can be accessible and enjoyed by all, whatever your dietary requirements. Georges style is friendly, informal, and relaxed and cooking is often accompanied by a glass of wine or raki. He thinks cooking should be a fun activity to be shared with friends and there are no strict rules to his cooking. He believes the freshness of the ingredients make the dishes and uses only local ingredients. George is passionate about the island of Crete and so as well as taking you on a culinary journey to discover the islands cuisine, it will also be a cultural one. Porto Club is a family founded company that set out to share the wonders and mysteries of Cretan regional cuisine with the world. Founded on the principles of passion, sharing and learning we pride ourselves in enjoying with others the uniqueness, wonders and pleasure of Cretan Vegetarian regional cuisine while ensuring to intertwine these with an understanding of the production, pride and culture specific to each region. In Crete, a meal is not only a celebration but also a culmination of various events. Enjoy culinary explorations that blend all the secrets particular of the region of Crete and let you enjoy and learn about them first-hand alongside the locals. Going from one region of Crete to another changes not only what you eat, but how you eat it, how its prepared and what accompanies it. Each region is a mystery unto itself. Immerse yourself in the fantastic flavours and mouth-watering smells of regional Crete. We believe that the most authentic way to experience and understand the heritage of Cretan culture, nutrition, history, way of life and its people, is in the company of a local scholar, walking through streets which are alive with religion, art and history, immersing in the architecture, learning about the life, traditions, and customs of Cretan people, past and present. You will sample some of the finest meals as well as fruit and vegetables in the world. You will drink selected spirits (ouzo, raki, liquors) and wines that will elevate your spirit and help you relax, and relish the excellent traditional cooking in some of the less obvious restaurants that we will point you out. Follow Porto Club Vegetarian lead, come on a route of adventure, travel and wonder as you explore the mysteries, flavours and customs particular to various Cretan regions on our unique & authentic Cretan vegetarian food holiday. We can promise you we will not be part of any tourist trail or the sheep following mentality. Our aim has always been to offer quality not quantity, so Porto Club remains small but perfectly formed. 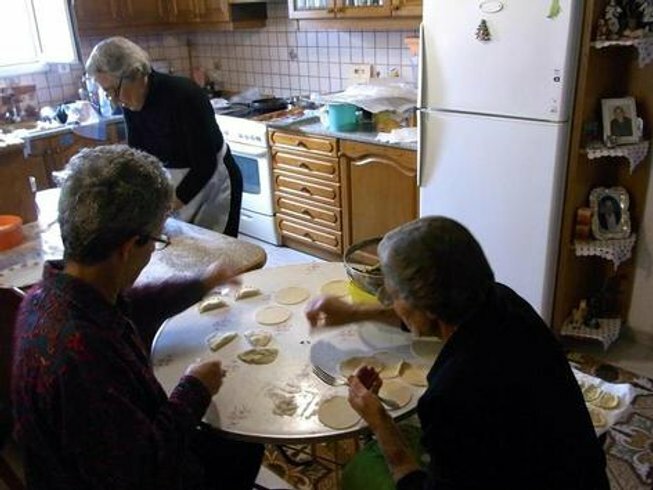 We offer a unique opportunity to experience at first hand authentic Cretan regional cooking techniques and recipes that have been developed and handed down over generations. All of the ingredients you will use are bought each morning from local open market and so you will be working with fresh fruit and vegetables in season. Throughout our cooking you will learn about the ingredients and the traditions around the dishes. You will learn the passion of the Cretan kitchen and, importantly, have a lot of fun and enjoyment doing it. Your week in Crete will be as much a hands on cooking experience as a cultural one. George will introduce you to the philosophy of local cooking and its traditions. You will learn about the history of Cretan cuisine and how it was influenced by its occupation for more than 2000 years. You will learn the inspirations behind the Cretan dishes, the methods employed by local producers, how to make a variety of Cretan dishes from simple ingredients you can find back home, how very few ingredients can be the basis for 6 or 7 dishes. You will learn how to prepare traditional Cretan dishes adapted to vegetarian requirements but never compromising on flavor as well as the cooking techniques and methods used to create the dishes. All prices listed are in USD$. If you are paying in a different currency, your price is locked in with USD$. But the price in your currency will depend on the exchange rate at the time your deposit is charged, then again when your balance is due. If you would like to lock in a price with a currency other than USD, you can do so by paying the full amount at the time of your reservation. 30% of the total is due at time of booking to secure your spaces. The balance is due 60 days before your tour begins. If you booked more than six months in advance. your deposit is refundable within 50 days of the time you place your reservation. If at the time of cancellation, it is more than 180 days in advance of the vacation, and also more than 50 days after you made your deposit, your deposit is non-refundable, but we will be happy to apply 100% of it toward any of our other vacations anytime within the next 12 months. If at the time of cancellation, it is between 180 and 90 days in advance of the vacation, your deposit is non-refundable, but we will be happy to apply 40% of it toward any of our other vacations anytime within the next 12 months. If at the time of cancellation, it is between 60 and 14 days in advance of the vacation, your deposit is non-refundable, but we will be happy to apply 40% of it toward any of our other vacations anytime within the next 12 months. If at the time of cancellation, it is between 14 and 0 days in advance of the vacation, your deposit is non-refundable, and we unfortunately cannot apply any portion to future vacations. These cancellation terms reflect times that we must pay out expenses for your trip on your behalf. At times that we no longer offer refunds, we have already paid out the associated costs, and refunds are not available to us. Because of this, we are unable to bend these terms. In Crete, tipping drivers, guides, etc. is customary but not mandatory. Our guides, host, driver, etc. all happily accept tips, but they are never expected. We have seen guests leave huge tips for our staff, and we have seen guests leave no tip at all. Either way, both of those guests are equally appreciated. Entrance fees at archaeological or historical sites not included. Pay when you enter the site. Alumni discount is available. Please contact us. High season charges may apply and to be confirmed. Minimum age 8. Under 18 must be accompanied by an adult. "First of all thank you for the wonderful week with you in Crete and immersing me in the Cretan culture, food and beautiful scenery. Your vibrant personality made it so much more fun. Thank you also for sending me the recipes, I will put them to good use. Again thank you again for the wonderful time in Crete, and the cave dinner was truly a highlight during that week." "I just wanted to say, that you are a true professional and a very special person. You made the experience truly memorable. You treated all of us like family instead of just strangers. You took us to local eating establishments which really enriched the experience. The cooking classes were a lot of fun, they were very hands on, which I bloody loved. You went out of your way to make sure that we all had a fabulous time. The lodgings were very nice and the location was really spectacular! George I will always remember my time there as very special, and wish you and your family the very best. I will always have a grand smile as I remember my time in Crete." "I cannot thank you enough for the truly remarkable experience in Crete. Since I arrived back in the USA, I have cooked several meals using the principles you shared with us and enjoyed every one of them. Unfortunately we cannot get the freshest ingredients, but even the techniques you showed (simple combinations of ingredients that show up in most dishes, grating tomatoes, different ways of chopping onions, cooking with potatoes, and so on) have been very useful. I cannot wait to entertain others with the Cretan cuisine! The best part of the trip was that you took us to places that tourists would probably never know about, where you knew the people and their families. That made the vacation especially authentic and memorable. Even the long drives were okay, because we got to experience the wonderful sights of the island." "David and I enjoyed the week we spent in Crete. The sites we visited and the food that was cooked and ate were definitely unique and delicious. Below are some feedbacks on the culinary tour. 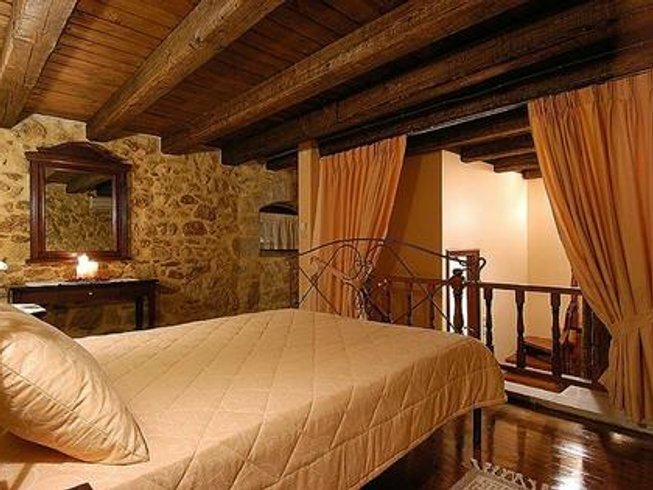 Thalori’s location in the mountains and it is integrated into the village provide a local Cretan experience. George’s knowledge on Crete history and Thalori’s hospitality makes the visit enjoyable. The various local restaurants that we ate at enabled David and I taste local Crete food and cooking. The ingredients were very fresh, very delicious. The cooking experience where we got hands-on experience in preparing and cooking Cretan food each night. The small group setting allows the group members and George to interact and build close relationship during the week. This helps adjust the flexible itinerary if the group likes to explore/visit some different sites. The bottom line: the food and alcoholic beverages were great." "Our trip was great, but of course, the highlight was our week on Crete. We have already made tsaziki, lots of boiled and sautéed greens, the cucumber appetizers, the eggplant dip, and greek salad. We bought some grape leaves and phyllo dough so will try making some more dishes soon. As far as critical thoughts about our stay in Crete, we enjoyed the trip and learned so much about Cretan food, culture, and history. Thank you again for a fantastic week full of learning and good memories." "I am writing to you because I am still awestruck by the experience of a lifetime! I could never have imagined how wonderful, gracious, enjoyable and entertaining a vacation it was to be. I absolutely fell in love with Crete and George. I couldn't have planned a better trip and I can't wait to go back. Thanks for all your help and please tell everyone this is the vacation not to be missed. There was plenty of everything. I didn't want for anything!" By BookCulinaryVacations - With more and more people opting for the Vegetarian and Vegan way of life, there are still some who wonder whether such lifestyles are merely fads. BookCulinaryVacations recently had an insightful chat about this particular topic with Giorgios Portokalaki (George), the founder & owner of Porto Club Travel Services, a travel provider for small group exclusive weekly packages on the island of Crete. George explained to us that contrary to most beliefs, the popularity of Vegetarian and Vegan based diets have been long been established beyond the past few decades. In fact, in Greece, these lifestyles have been commonly adapted since thousands of years. Curious to find out more? Read on! By George - Before the turkey, poultry was imported in Greece. 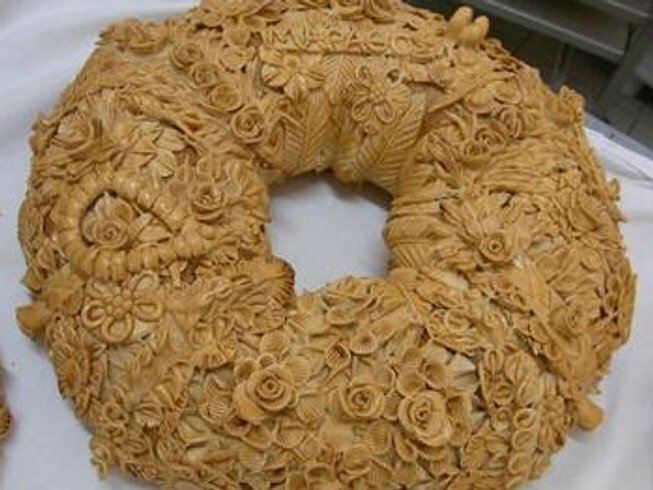 Each region of Greece had its own food for Christmas time. Some dishes with pork, and others with duck, goose, wild boar, or rooster. In the Cretan Christmas table, pork was mainly used and this was due to the Choirosfagia (sacrificial pork). The butchering of faltered pig, brought up with particular care from households of Cretan and Greek rural areas, was certainly the most generalized custom in Greek cooking, with roots from the antiquity. By Ian - Our food and wine tour in Crete was amazing and George was the most generous host and excellent cook. At least ten different plates served at breakfast, totally over the top lunches, and we cooked dinner every night with George, except for the cave dinner. We were treated to an ancient shepherds’ mystical cave dinner serving ancient Minoan foods. This has to be the most amazing food experience ever, certainly up there with anything we've experienced. By George - Cretan cuisine is one of the most tastiest and healthiest cuisines in the world. From historical evidence and mythology, we learn about Cretans’ nutritional preferences throughout the centuries as well as their fondness for basic products. Cretan food is said to be the ideal diet which ensures good health and long life. Research shows that people who eat according to Crete’s traditional ways, have less chance of suffering from heart disease, and are generally healthier even than people living in the neighboring Mediterranean countries. I am George Portokalakis Travel provider founder of the Porto Club travel services www.portoclub.gr located in city of Heraklion island of Crete in Greece Since 1970 my main occupation is Tourism. In the last 16 years I am specializing in the field of special concepts of tourism with emphasis in culture and food as well as student / school travel. The suggested programs , routes , restaurants, farms , homes are always under close supervising by me personally and the special relations I have with everybody concerned, guarantees the perfect service. Last 3 years I provide culture / food and hands on cooking classes in Crete / Greece I am travel professional passionate with Cretan traditional Mediterranean cooking, food as well and culture and love to share this passion with my guests. Visit PortoClub's profile on Pinterest. OLD, TRADITIONAL COOKING METHODS WE USE STILL IN GREECE AND…WE LOVE IT!! We are Greece destination D M C / travel providers located in the city of Heraklion island of Crete - Greece. We are operating special concepts of travel as Food, Wine, culture and hands on cooking classes offering a combination of entertainment, cultural and archaeological sightseeing, guided tours, food and wine tasting and last but not least hands on cooking classes www.portoclub.gr. Copyright Food and Wine Tous in Crete | Designed by VeeThemes.com.